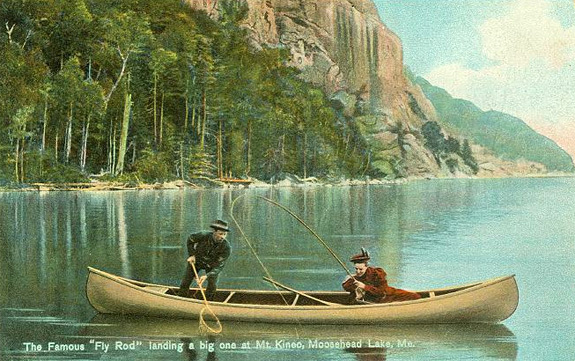 The Famous "Fly Rod" landing a big one at Mt. Kineo, Moosehead Lake, Me. Circa 1908. Face it. Much of Maine’s scenic landscape is untamed wilderness. When people lived closer to the land, hunting and fishing for their supper, heading out into this wilderness was much like city-folk heading to the supermarket. Modern shoppers deal with parking lots, insane traffic and check out lines that sometimes snake down the aisles. Our wilderness cousins had their own shopping annoyances. They dealt with ornery bears, cougars and wolves trying to steal whatever they happened to shoot. Moose were also a problem. They were on the menu and none too happy about it. When something weighing up to 1,800 pounds and carrying a set of antlers nearly two yards wide decides to charge, you do tend to be the one that blinks. Crosby was a skilled marketer and through her columns in newspapers throughout Boston, New York and Chicago, she promoted Maine as the perfect destination for the outdoorsman, and outdoorswoman. Crosby also made personal appearances, including one at the First Annual Sportsmen’s Show held in Madison Square Garden in New York. It’s hard to say whether Crosby caused more of a stir confidently handling a rifle or wearing a knee-length skirt at a time when glimpsing a woman’s ankles was bordering on the sinful. All of that promoting resulted in Maine becoming a magnet for vacationers and the current 4,000 licensed Maine guides registered with the state. What Does it Take to Become a Maine Guide? It takes up to a year to complete all the required applications and tests to become a Registered Maine Guide. Each must be licensed in at least one classification of outdoor sports and/or activities, and each classification must be applied for separately. Hunting guides must show they are skilled in all forms of hunting and trapping and must be familiar with wilderness camping. Fishing guides must be familiar with all forms of freshwater fishing, and again show skills in wilderness camping and survival. Guides must also have current hunting and/or fishing licenses. The recreational guide must not also be a skilled outdoorsman, but be familiar with snowmobiling and boating activities. Whitewater guides require an additional application and certification. Sea kayaking guides specialize in ocean kayaking and camping on remote offshore islands, and tide-water fishing guides are skilled in leading ocean fishing and camping trips. Both of these guides are licensed to operate inside the three-mile limit, the part of the ocean that is considered Maine territorial waters. Guides operating their own boats must be licensed with the U.S. Coast Guard. All guides must also have American Red Cross first-aid certification before they apply. Once all oral, practical and written tests are complete, the applicant is a Registered Maine Guide. This includes proficiency tests in navigation, compass reading, wilderness survival and the handling of emergency situations. After five years of experience, based on hours not calendar years, in a specific classification, a guide may apply to be a Master Maine Guide. Once granted, that certification is valid as long as the guide’s license remains valid. Using a Registered Maine Guide lets you get the most out of your Maine wilderness experience. Let’s say you want to do a bit of fly-fishing for brook trout or land-locked salmon. A guide can show you where the fish are hiding, give you a lesson or two on fly-fishing and even recommend a place to spend the night. Your fishing trip might even include a bit of back-country camping. Some Registered Maine Guides are pilots and can get you to that remote fish-filled lake or pond by float plane. Rates vary depending on the method of transportation, the length of your trip and the type of fishing. For example, a two-day brook trout fishing trip by canoe might cost $320 per person. An ice-fishing trip might require a snowmobile or dog-sled ride to that heated shack on the lake and can start at around $350 per day. This type of fishing is an iconic Maine experience but can be challenging for the novice. A Registered Maine Guide knows where all the safe ice-fishing spots are. Remember, the fish are supposed to be in the water, not you. The same reasoning applies to hunting trips, paddling adventures along the Allagash Waterway or photo safaris on land or on the water. Some Registered Maine Guides operate their own hunting lodges and offer weeklong hunting vacations including lodging and meals. A seven-night moose hunting vacation including all transportation and meals might average $2350 per week, depending on amenities and location. A day guide rate during deer season might run you $200 per day, usually with a minimum night stay. Guides can help you with Maine hunting and fishing license regulations. Registered Maine Guides also provide a valuable service for those wanting to track wildlife for photo-ops. It’s nice to have an experienced woodsman nearby when a bull moose takes more than a casual interest in you and your camera. Guides also know the best places to find fall colors, the backwater streams leading to pocket beaches worth camping on and how to get close enough to a lake-bound loon to get the perfect shot. Sample rates include a four-hour nature paddle, ride or hike for $35 per person and a five night fall foliage or moose safari including accommodation, meals and transportation for just under $1,000 per person. Click here to see the directory of Registered Maine Guides. Many towns in Maine, particularly those in or near hunting and fishing areas have their own local sportsmen’s associations. One example is the Rangeley Region Guides & Sportsmen’s Association, founded in 1895 and the oldest such organization in the state. Not only do they promote the sports of hunting and fishing, they emphasize conservation and respect for and of the wilderness. Sports associations are a great place to start when planning your Maine wilderness vacation, and handy in finding that all important Registered Maine Guide. This particular family-friendly club offers hunter safety courses, archery classes, a shooting range and a fishing pond for all ages. Various events are held each year, such as the Strawberry Festival and a Steak and Salmon Cookout. The association also takes part in the annual Maine Sportsmen’s Show, usually held the end of March. Maine Guide pioneer Cornilia Thurza Crosby would be most pleased.